The yellow rabbit Josefin's family is growing. Now her little sister, Sofie is ready to enter the main role in a children's play for the preschool children. The second Sofie game that was released at the same time, Rabbit food and plant edition, consists of nine mini games and activities aimed at preschool children aged 2½ to 5 years. You who already bought Sing, Play & Learn or are thinking about buying both games should know that three of the mini games are identical in both games. It is a puzzle, a painting game and a memory game. It has of course different motives in both the puzzles and the memory game. In addition, the song play is structured in the same way in both games. Sofie sings five famous children's songs for happy, animated illustrations. Other mini-games are based on a theme - the garden. 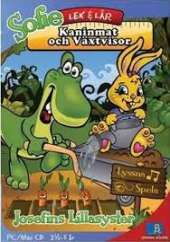 A funny figure is Gammelsvamp who is the main figure in two mini games. He likes to tell tales, but has forgotten the text. In one mini game, the children look for text sheets that are hidden in the tool shed. In the second game, Gammelsvamp forgets the last sentence of the story and the children themselves put together an end using a number of words.